Here comes a new series here at Bioscope Towers (though there are number of old series in dire needing of being kept up, I’m aware). 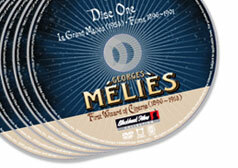 There’s not enough done here on single films, beyond the occasional mention of DVD releases, so we’re going to institute Video Jukebox, which will be an occasional series that takes a silent film available online and gives some of the background history – particularly if the site which hosts the film doesn’t tell you that much. I’m going to start off with The Battle of the Century (1921). I was surprised to see this as an addition to European Film Treasures, as I wouldn’t have suspected that the BFI (which holds the film) would have singled it out as a choice item from its archive – not least because it is not a European film. Nevertheless it is strongly European in theme, Europe v America in fact, and it is certainly a film well worth seeing and with a story behind that is equally worth telling. It’s 1921, and the jazz age is upon us. It is an age of celebrity fashioned by the newsreel cameras, where to be in the public eye means that you must maintain a constant virtual screen life. The stars to be found in the cinema are not just actors but politicians, royalty, aviators, explorers, artists, socialites and especially sports stars. The barrier between the arena and the cinema was broken down as leading sports events were filmed (with their funding often dependent upon the sale of film rights) and sports stars were pushed into becoming film stars by trying out their acting skills on the screen – generally with painful results. 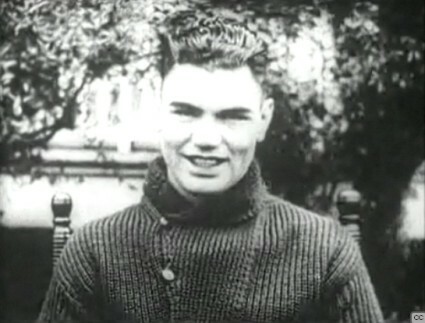 Jack Dempsey was one of the stars of the age, in the boxing ring, and on the screen. He wasn’t much of an actor – he appeared in several silents including the serial Daredevil Jack (1920), Fight and Win (1924) and Manhattan Madness (1925) – but his screen presence when fighting, sparring, training or just grinning for the ever-present newsreels was utterly compelling. The pinnacle of Dempsey’s career, fistically and cinematically, was his bout with Georges Carpentier, the French world light heavyweight champion, who also enjoyed a modestly successful film career with The Wonder Man (1920) and A Gipsy Cavalier (1922). The fight was a masterpiece of hype from legendary promoter Tex Rickard, and saw boxing’s first $1,000,000 gate. 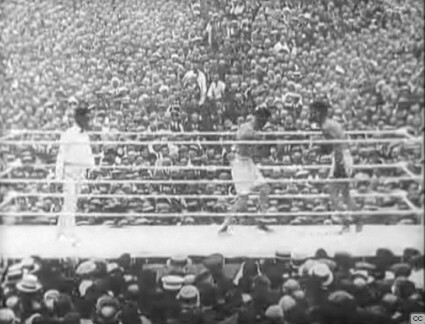 The fight, held at Boyle’s Thirty Acres, Jersey City on 2 July 1921, was in no way an even match. Jack Dempsey was a far heavier (by 25lbs) and far more powerful fighter. But Rickard cleverly built up a good-versus-evil angle, with Dempsey having been widely accused of draft-dodging, while Carpentier was a war hero, having been awarded the Croix de Guerre. Dempsey’s thick-set, brooding look contrasting with Carpentier’s elegant demeanour helped accentuate these matters, but there was a contrary undercurrent in that Dempsey was the all-American figure while Carpentier was Old World and maybe just a bit too fancy. Either way, it was a contest where no one was going to be allowed to be neutral in their opinions. Rickard targeted a new female audience for boxing by building up Carpentier’s appeal and improving facilities at the venue. He was rewarded with a crowd of 80,183 and an overall gross of $1,789,238, twice the amount of any previous fight. Rickard knew that money attracts money, so he made sure that everyone was aware of the huge sums being paid to the boxers: $300,000 plus 25% of the movie rights to Dempsey; $200,000 plus 25% of the movie rights to Carpentier. The movie rights were an essential feature of these calculations (despite an official ban on interstate commerce in fight films). 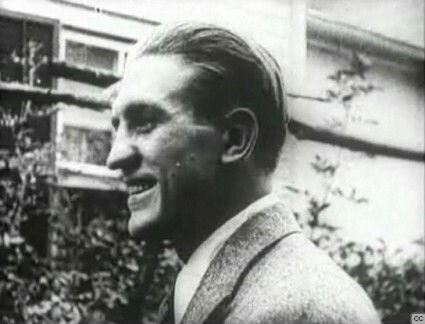 The film was produced by Fred C. Quimby (who had first signed up Dempsey for Daredevil Jack), with the filming itself overseen by George McLeod Baynes. Entitled The Battle of the Century (Rickard’s own billing for the fight), the film employs all the tricks of the cinema to create one of the very best sporting movies of the silent era. It builds up the fight, far more fluidly than earlier fight films, with scenes of both fighters in training, the special stadium under construction, the crowd arriving, the press at the ready, fingers on the ticker tape machines, dissolves, close-ups and astute camera angles all tensely and rhymically edited until the point where the fighters enter the ring. The film at this point loses some of its rhythm by inevitably following the action in real time, and by doing so initially with limited, static coverage from a single camera position perched precariously on the top of a tall stand. The fighting is intense but it is sometimes hard to tell the two fighters apart. But as the fight progresses through its four rounds the film picks up once again, close-ups increase, the camera pans with the action and as Dempsey moves in for the kill we watch transfixed as Carpentier is felled, leaps up instantly, is brought down again, and stays down. Despite the interstate ban, the film was widely shown. Dan Streible, in the essential Fight Films, describes how Quimby organised distribution to twenty different states by employing anonymous couriers who delivered unmarked packages to hired attorneys, “who knowingly received the contraband, then either sold prints with state distribution or exhibition rights or left reels for theater managers to screen”. When even President Warren Harding and Vice-President Calvin Coolidge attending a screening of the film at a private party, then this was a film where public will was always going to override the law, come what may. Quimby made plenty of money, picked up a federal conviction along the way, then went on to join MGM and to pick up a string of Academy Awards as head of its animation unit, featuring in particular a certain battling cat and mouse. The Battle of the Century is available in its full 34-minute glory from European Film Treasures, complete with a piano score by Antonio Coppola. For more information on the fight, read Randy Roberts’ racy and superbly-written Jack Dempsey: The Manassa Mauler. Thanks for the enjoyable essay. The fight was a masterpiece of promotion. It has been years since I read Dempsey’s autobiography, but I remember he spends time talking about how people treated him as a suspected draft-dodger. I don’t think he spoke much about his film career. He spoke highly of Carpentier, but he spoke highly of most of his opponents. Dempsey said of his film career, “When I started I was really bad and I never got any better”. It’s a really interesting history, that of sports stars appearing in films, not least because it was a tradition that started pre-cinema when boxers and the like would make their money from appearing in plays based around their persona and the practice then carried on into the new medium. Sounds like the subject for a post, one day. Carpentier was a fair actor too. I’ve seen him in The Gipsy Cavalier (a costume drama made by J. Stuart Blackton in Britain in 1922), and he acquits himself tolerably well. Certainly more credibly than Dempsey, I should imagine. I wonder what Le Roman de Carpentier was. It isn’t mentioned by Dan Streible, and it doesn’t turn up on IMDb. Was it a fiction film, as Cinema Context suggests? Aha – I should not have trusted to the IMDb name record for Carpentier. IMDb says it starred Harry Baur, though I can’t imagine him as Carpentier. At any rate, it sounds like a remarkably early example of a biopic of someone then living.